Are you considering enhancing your home or commercial space with a beautiful, custom staircase? Many assume that the custom stairs planning process must be a long, laborious one. We have great news. With the support of our industry-leading team, you can plan a custom staircase design in 4 simple steps! What inspires the interior design of your home? What does the physical layout of your home or commercial space allow? 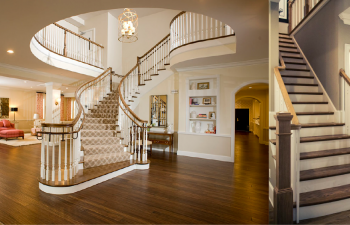 Will you be designing custom straight stairs or a curved staircase? Do you prefer closed or open riser treads? What are your thoughts on flared starting steps? What type of baluster system interests you, traditional or modern? With endless choices, finding your source of inspiration is the first step to planning your custom staircase design and will help to guide you throughout the process. Now that you have nailed down your inspiration, the next step to custom staircase planning is selecting your product. Our outstanding design team will support you in choosing the type of staircase that will best bring your inspiration to life. Round staircases are a timeless choice, bringing grace and elegance to a space. 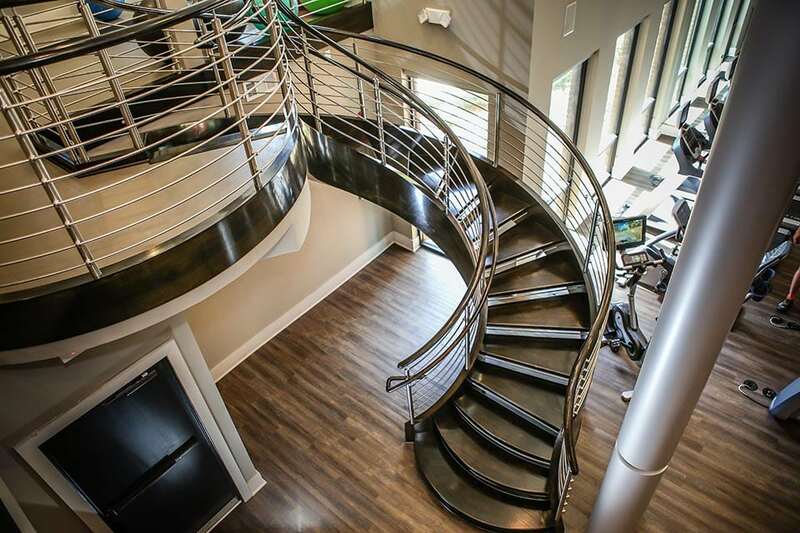 Flowing seamlessly from one level to the next, round stairs vary in design and are a popular choice for custom stairs. Curved staircases come in many shapes and sizes, from spiral stairs that maximize space to grand arcs that command attention. Do you prefer clean lines? Custom straight staircases are also a beautiful option. A straight run of stairs between landings, straight staircase layouts include L-shaped, scissor stairs, and those without any changes in direction. Straight staircases offer variety, with styles ranging from traditional to modern and designs from simplistic to very complex. Following the collaborative design process, your custom staircase order will be placed, and you will receive drawings from our industry-leading design team. Once drawings are approved, you will choose the delivery and installation option that best fits your needs. Our team will take it from there! Delivery Only: Staircase will be crated and shipped to the job site for installation by your trim subcontractor. Delivery + Stair Installation: The staircase will be delivered to the job site and installed by our craftsmen. Loose handrail parts will also be delivered, and your trim subcontractor will handle installation. 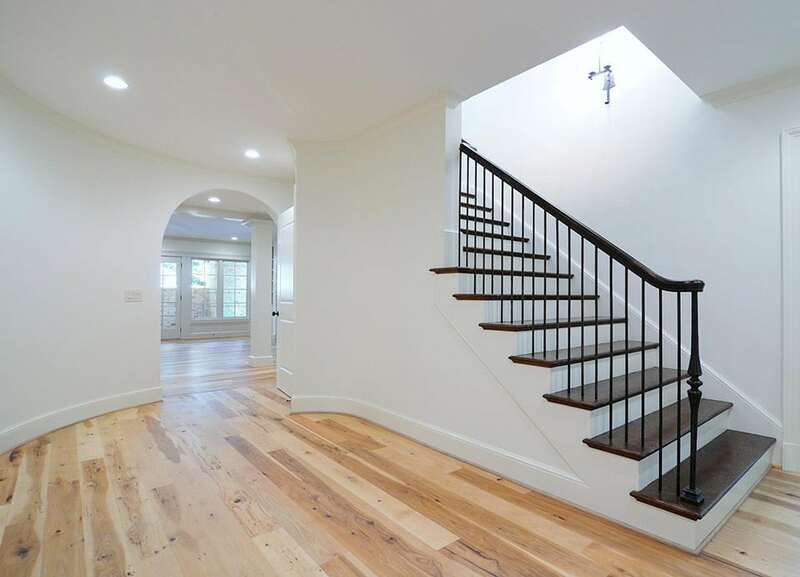 Delivery + Stair Installation + Pre-fit Handrail: The staircase will be delivered and installed by our expert team, followed by the delivery of a pre-fit handrail system to be installed by your trim subcontractor. In the prefabricated (dry-fit) process, the handrail system is cut to fit and installed on the staircase in our facility, complete with newels, balusters and fittings. The system is then packaged into a kit form for easy installation at the job site. Turnkey Installation: Many clients choose our turnkey installation option, through which our team delivers and installs the complete staircase with pre-fit handrail system. With a single point of contact and a proven project management system, this approach ensures flawless execution and a seamless installation process.